For years, Revit users leveraged Shared and Family parameters within families by labeling dimensions, adding formulas, and associating parameters. These techniques have been restricted to the Family, In-Place, and Conceptual Family Editors. Well, not anymore. Global parameters now expose those techniques to the project environment. While I was teaching a Revit Structure Fundamentals class, a student asked me to give an example of when to use a Global Parameter. At the time, we had just finished an exercise in framing a roof with K-Series Bar joists. The workflow required that certain beams be lowered to seat the beam systems of bar joists. Well, beams have a “z Offset Value” parameter which can lower or raise a beam’s elevation relative to its associated level. In the case of this exercise, the “z Offset Value” parameter was changed to -2-1/2” to lower the beams. Easy enough to change. But, what if you needed to quickly change it back to 0” a week from now when the joists are no longer bar joists? As in families, the “z Offset Value” Instance parameter of the selected beam instances are now controlled by a single Global parameter. The project’s Global parameters can be accessed from the Manage tab>settings panel. Like the Family Types dialog, the Global parameters dialog has tools to manage, create, and edit Global parameters. Its layout almost parallels the Family Types dialog. I proceeded to take it to the next level. I created another Global parameter called “Is Bar Joists” of the type Yes/No. Using a simple conditional statement formula in the Roof Beam z Offset Value parameter allowed the Is Bar Joist parameter to control the beam’s z Offset Value with a checkbox. Clearing the checkbox made the condition false resulting in a 0″ offset. The Beam Systems’ Beam Type can then be switched back to a Wide-Flange. Another example, is to label dimensions with Global parameters. In this architectural example, I can label dimensions to control the offset of door jambs to an adjacent wall. Like before, the Global Parameter Properties dialog will open for me to create the parameter “Door Jamb Offset.” This single parameter can manipulate all the single acting doors throughout the project which are adjacent to a wall. After the dimensions are labeled, they all take on a common value. 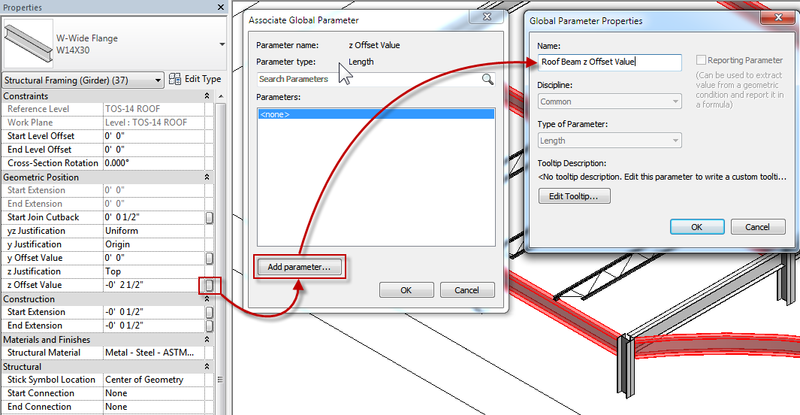 Launching the Global Parameters dialog from the Manage tab, I changed the value of the “Door Jamb Offset” parameter to 4″. The results propagate to all the labeled dimensions. As with normal dimensional constraints, you can delete the constrained dimensions controlled by Global parameters and Revit will maintain them. Using the the new Reveal Constraints command can uncover them. As you can see, Global parameters have many benefits in your project. Keep in mind though, Global parameters are not accessible in Element properties or schedules, yet! It is my hope that Autodesk exposes more System parameters that can be associated to Global parameters in the future.